I got this recipe from Grandma Milne. I made and shipped these cookies to your dad when he was a young missionary in England. Boil for at least one minute: sugar, cocoa, milk, butter. Add salt. Pour over oatmeal and nuts. Add vanilla. Drop spoonfuls onto wax paper and let cookies harden. 2 In large bowl, beat granulated sugar, brown sugar, butter, vanilla and egg with electric mixer on medium speed or mix with spoon until well blended. Stir in flour, baking soda and salt (dough will be stiff). 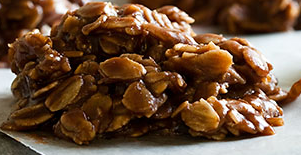 Stir in chocolate chips and nuts. 4 Bake 8 to 10 minutes or until light brown (centers will be soft). Cool 1 to 2 minutes; remove from cookie sheet. Cool on wire rack. These were delicious. We made them for Brooklynn and Adam’s bridal shower. Note to self: The frosting recipe could probably be cut in half. Ingredients needed: 1 cup chopped dates, 1 stick butter, 1 egg, 1 cup sugar, 1/2 cup chopped nuts, 2 1/2 cups Rice Krispies cereal, coconut, 1 teaspoon vanilla. This recipe is from the dear little old lady we used to live next door to who would make these cookies for you kids. Combine ingredients and spoon cookie dough on cookie sheet. Bake at 425 degrees for 5 to 7 minutes. I got this fabulous cookie recipe from my friend Tamara. 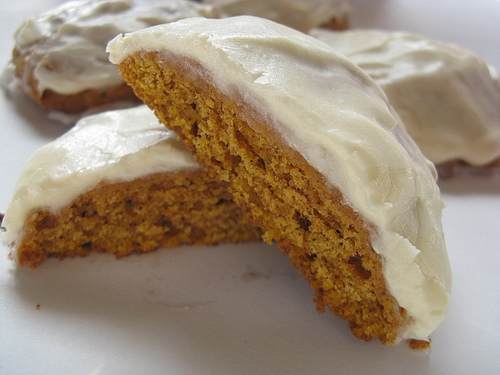 This is one of the BEST pumpkin cookies I have ever tasted and frosting is fantastic. Mix together all ingredients except flour and chocolate chips. Then stir in flour and then chocolate chips. Bake at 375 degrees F. for 12-15 minutes. Then remove and frost. Frosting: 1 teaspoon allspice, 1 teaspoon cinnamon, 1 cups powdered sugar, 1 teaspoon vanilla, 1-2 teaspoons milk 3 tablespoons butter (melted). Mix all ingredients together.